Our Start Shooting Better series continues this week with a look at the Casino Drill. 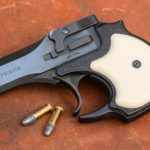 This drill tests a lot of different pistol skills, but don’t be fooled — it’s really an exercise to see how well you can think and shoot at the same time. Watch the video below for details, or scroll down for the transcript and links to the targets you’ll need. CHRIS: Welcome back to yet another episode of Start Shooting Better. I am Chris Baker from LuckyGunner.com joined by John Johnston from Citizens Defense Research, also the host of Ballistic Radio. 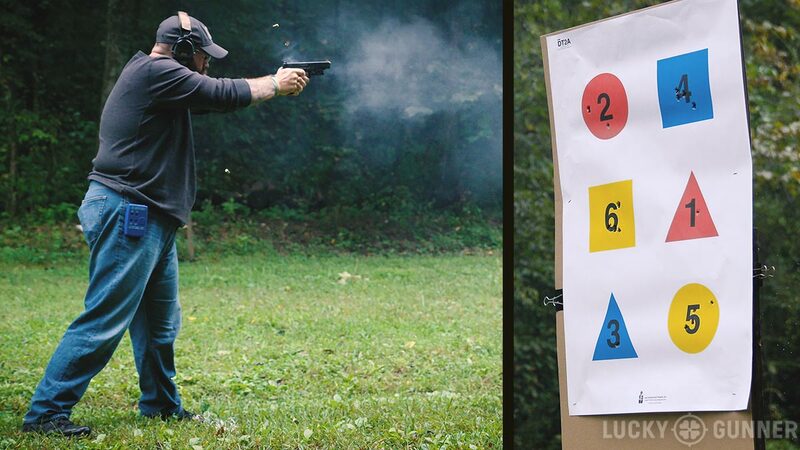 In this series, we’re bringing you a variety of different drills and tests you can try at the range to help you improve your shooting ability. Today we’re looking at one of my favorite drills to fail; the Casino Drill. This is one that Tom Givens came up with. You get to run it in his classes. John, why don’t you give us the details on that. 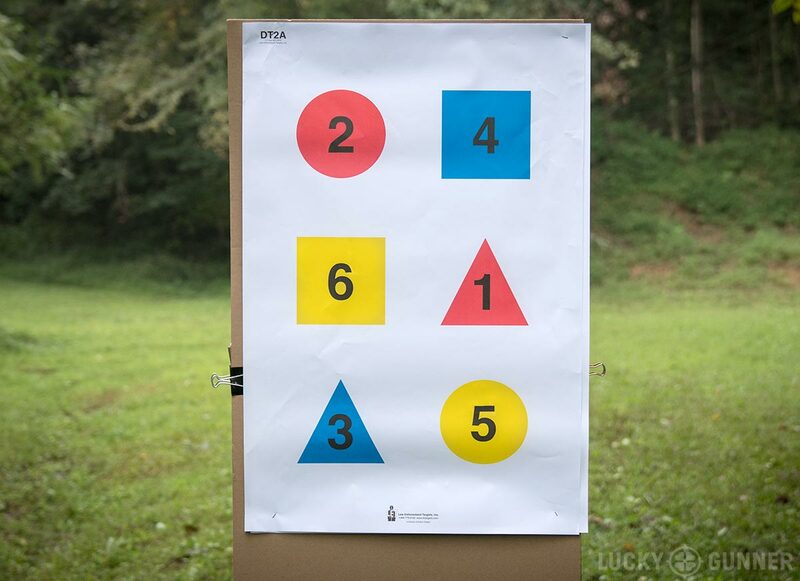 JOHN: So what we’ve got is six primary school shapes; you’ve got triangles, circles, and squares arrayed on a target and they are numbered 1-6 [you will need one of the three versions of the Discretionary Command Training Target, available here, here, and here]. The goal of the drill is you draw and fire one round on the 1, two on the 2, three on the 3, [four on the 4, five on the 5, and six on the 6]. So it’s 21 rounds in 21 seconds at 5 yards. 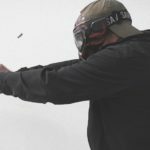 Essentially, what you’re doing is testing your ability to process information while presenting the gun quickly, getting accurate, fast hits, and also performing reloads under stress. CHRIS (VOICE OVER): To run this drill, you need to start with seven rounds in the gun and two spare magazines with seven rounds each. So you will have 21 rounds total, and you’ll be forced to reload twice. 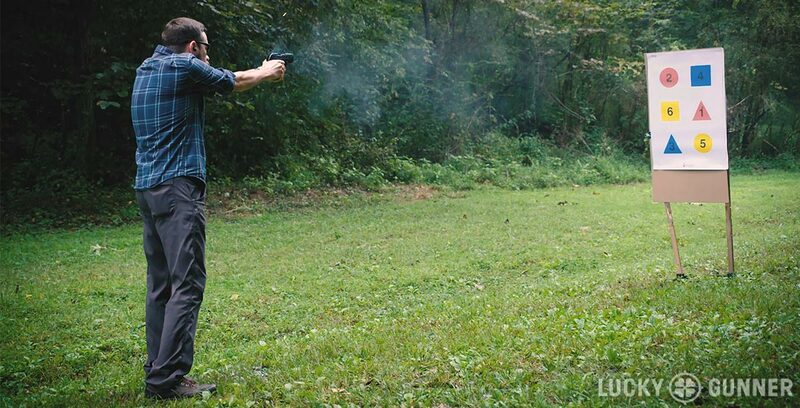 The starting position is from the holster, and every shot you miss adds a full second to your total time. You also add a second for rounds fired out of sequence or any other procedural errors. 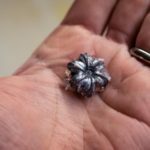 This drill tests your drawstroke, firing accurate multiple round strings, and emergency reloads. But the real purpose of the drill is to force you to think about something other than the mechanics of shooting. While your conscious brain is occupied with making sure you put the right number of rounds on target in the correct order, you are basically shooting on auto-pilot. 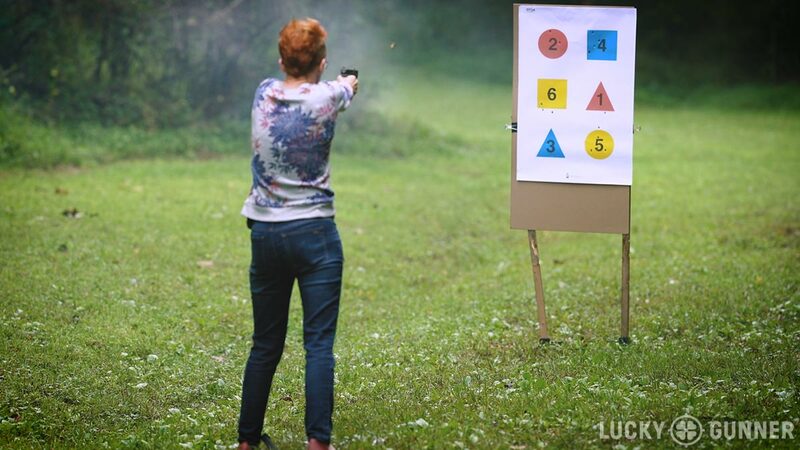 It’s a good way to test how well your shooting ability holds up under stress. If you practice the Casino drill over and over, pretty quickly you will start to memorize the sequence and that defeats the purpose of the drill. So you’ll want to change it up in order to keep it mentally challenging, and there are several different ways you can do that. You can use the variations of the Casino drill target that have the numbers and shapes arranged in a different order. Or you can load your magazines differently. Instead of 7-7-7, you can load 6-7-8, and mix them up so you don’t know when you’re going to have to reload. Or you can have someone else load your mags with any random number of rounds, as long as there are 21 rounds total in the 3 magazines. CHRIS: Do you know what the current standing record is for the Casino Drill, or something close to it? JOHN: High 10s… I think. High 10s, low 11s. The quickest I’ve ever done it is, like, a high 11, low 12. CHRIS: Not everybody needs to be chasing that time, though. You want to emphasize 100% accuracy, right? JOHN: Yeah, well, 21 seconds is plenty hard, especially if you are new or intermediate, or even on the low end of advanced. If you’re running it in 20, that’s an accomplishment. That’s something to be proud of. CHRIS: And there’s also a difference between shooting this on your own at the range and shooting it in a class in front of a bunch of people who are watching you and judging you, or, in this case, doing it on camera. JOHN: Yeah, no re-takes. So, I may crash and burn. You may crash and burn. I think Melody Lauer is with us, she’s going to shoot this as well and she may crash and burn. It is not an easy drill to pass 100% of the time. I drop shots on it all the time, especially if I start going too quickly. CHRIS (VOICE OVER): I decided to run the Casino drill with my Beretta PX4 Compact 9mm. It’s very easy to rush this drill and start making mistakes or lose track of how many rounds you have on each target. I wanted to make sure I ran this one clean, so I was taking my time and not going any quicker than I could absolutely guarantee 100% accuracy. I probably moved a little slower than I needed to on that second reload, but I did manage to shoot it clean and came in just under the 21 second par time at 20.98. Melody Lauer shot the drill with us using her everyday carry Boresight Solutions custom Glock 19. At the end here, she’s going to miss a couple of shots starting with the first shot after the reload on the number 5 target. It’s very common to rush the first shot after a reload, and it’s also common to go too fast on those last 6 shots trying to make up time, and you end up throwing a couple of them. So Melody had a very solid time of 19.12, but we’ve got to add 4 seconds for the four misses she had, giving her a total score of 23.12. John is using his Boresight Solutions custom Glock 34. He decided to do one of the variations of the Casino drill, so we loaded his mags with 6, 7, and 8 rounds and handed them to him in a random order so he would not be able to predict when the reloads would come. But that does not seem to have slowed him down much, and John finished in 14.86 seconds with no misses. Okay, that’s the Casino Drill. There are a few different places you can get those targets, so I’ll post some links to that. Get out there and give it a shot.